Maruti: What is Web Service? "It might help to think of Web services in terms of your electricity supply. You don't generate your own electricity, you just plug in there. The electricity is delivered in agreed standard units and you have a meter telling you how much is being consumed." A webservice is any piece of software, that provides some functionality, is available over the internet, and talks using standardized XML. • Let ‘you’ = you OR any application OR just a piece of code OR something else. Now..
• You can talk to a webservice over the network via HTTP, SMTP, FTP, BEEP and many other protocols. 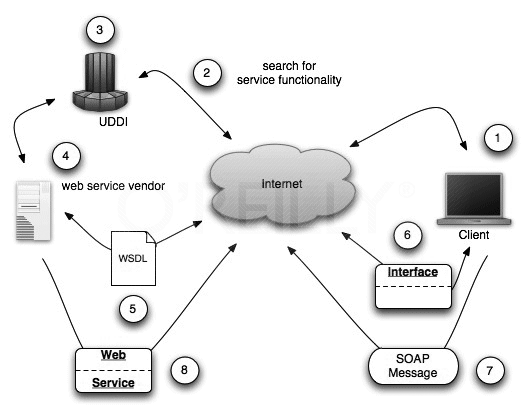 • When you talk to a webservice, the ‘talk’ part is done using XML in a standardized fashion. The current standardized fashion being XML-RPC and SOAP. 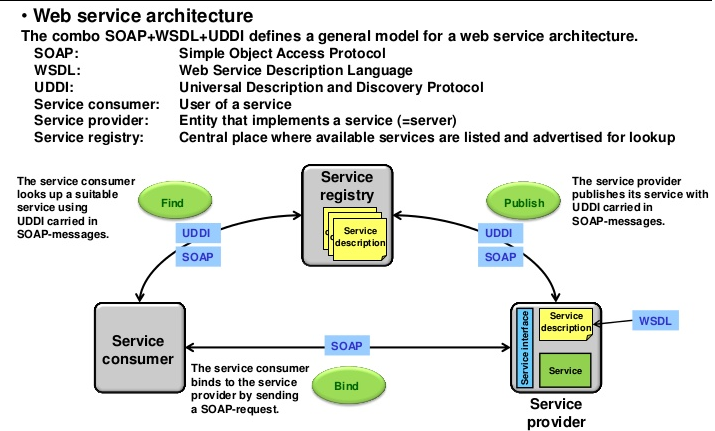 • All stuff that a webservice would do for you (functionality provided) and all things it would need from you to do so (expected input) is described in XML in a standardized way called WSDL. • Webservices live in registries in a way such that the right one for the job can be very easily found. This is made possible by another standardized XML way called UDDI. 1. Somewhere in the world a client wants to use a web service, so it seeks out a directory service. 2. The client connects to the directory to discover a relevant service. 3. By asking the directory service about the services available, the client is able to determine the presence of a service that meets the client's criteria. 4. The directory contacts the service vendor to check on availability and validity. 5. The service vendor sends the client a WSDL document. 6. A proxy class is used to create a new instance of the web service. 7. SOAP messages originating from the client are sent over the network. 8. Return values are sent as a result of executing the SOAP message.